As the New Year is upon us, all of us in the EOS organization want to wish everyone a very happy New Year. The new year will bring with it the beginning of the much anticipated Euro Offroad Series, kicking off in the Czech Republic on February 10th to 12th. As we prepare for the EOS, we would like to take this time to announce that the official race tire for the 2012 EOS will be dBoots tyres. Adam and all the team at dBoots have been working very hard with us to ensure the EOS will be a tremendous success and with the quality of the dBoots tyres it will prove to be a winning combination. For the EOS, we will be running 4 classes. 2wd Buggy, 4wd Buggy, 17.5 2wd Short Course and 4wd Modified Short Course and all classes will be using the dBoots tires. 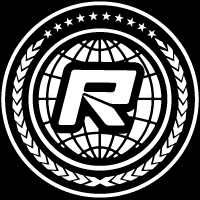 4wd Buggy and both SC classes will use control tires front and rear and in the 2wd Buggy class it will be control tyres only in the rear. The organisers of the Euro Offroad Series wanted to let everyone know of some immediate changes they needed to make regarding the beginning of the EOS. As our plans for the EOS had been set and were ready to go, we received information that the date we had scheduled for Round 1 was clashing with another event in the UK. As this would have been our first event for the EOS and the first time in the UK, the last thing we wanted to do was to conflict with another race event. So we had to make the decision to postpone Round 1 of the EOS. 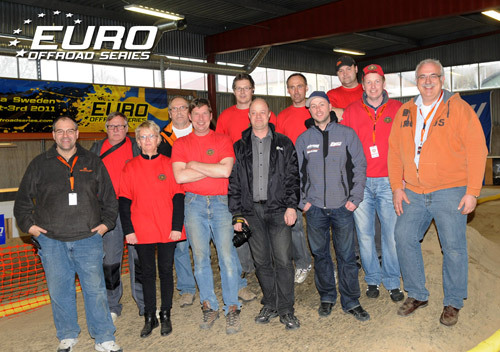 With this change, Round 1 of the EOS will be held 10-12 February 2012 in Hrotovice, Czech Republic. We have held many events with Michal Bok and his team for our Euro Touring Series and we know what a perfect venue they have. The track area is located in the sports hall area that is attached to the hotel and it has a very nice restaurant, bowling alley, bar and it makes for a perfect location to hold an event. Plus it is a very affordable place as the food and drinks are not very expensive. We understand this change may have caused some problems for some racers, but please know that it was something we had to do as we did not want to cause any conflict with the other event. We look forward to seeing everyone for Round 1 of the EOS and it will be the beginning of a great race series to showcase the fun that is off road racing – Scotty, Uwe and the EOS team. After much planning we are pleased to announce the dates for the much anticipated 2011/12 Euro Offroad Series. Scotty Ernst and Uwe Rheinard, the organizers behind the very successful Euro Touring Series ‘ETS’, have taken their format and formula and will be bringing it to the exciting world of Offroad. 1/10th Offroad racing in Europe is seeing tremendous growth over the past year and the EOS will embrace that growth and bring an organized racing series that will travel around Europe focusing on the fun and excitement that Offroad brings. Earlier this year we had our pilot race in Sweden and it attracted the top European offroad aces as well as the attention of some of the best US drivers. Making the trip over from the USA was now current World Champion Ryan Cavalieri and Reedy Race Champion and current US Champion Dustin Evans and for our inaugural season we are expecting continued support from some of the top US drivers. 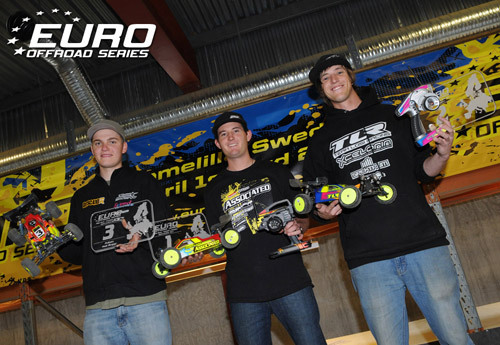 A three round series, round 1 will now kick off in the Czech Republic at the Sport-V Hotel in Hrotovice on February 10-12 2012, while round 2 is will be held in Charleroi, Belgium in March. Wanting to go out with a bang the finals are scheduled for April at the Intermodellbau Dortmund Hobby Show, Europe’s largest consumer Hobby Show. This will be a very exciting event and a great way to showcase to the large crowds how exciting our form of racing can be. Entries for round 1 can now be made at www.myrcm.ch. This event will fill up fast and very possibly sell out, so make your plans and signup for the first EOS event and find out how much fun you can have racing with us. We look forward to seeing you in the Czech Republic for round 1 of the EOS. UPDATE: Round 1 which was originally to be held in the UK has been cancelled due to calendar conflicts which has made it impossible to be run in this first season of the EOS. Full details on all the rounds can be found by visiting the series page here. 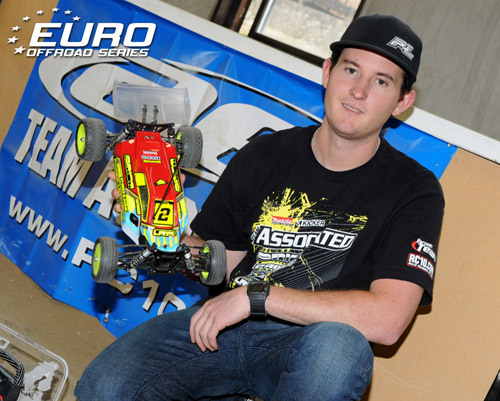 Team Associated’s Ryan Cavalieri has taken the 4WD Buggy crown at the Euro Offroad Series Pilot Event after taking victory over Joern Neumann in the final race of the day here in Tomelilla, Sweden. Three drivers went into the third A-Main with a chance of the title but before the first lap was even completed Top Qualifier Dustin Evans’ challenge was over. 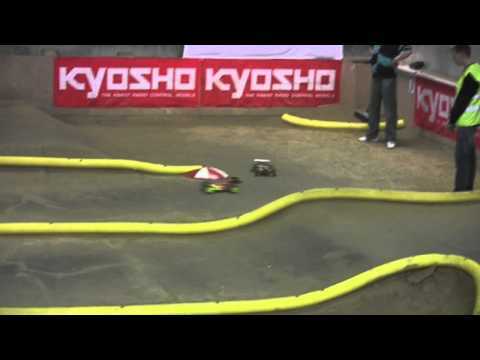 At the corner where he passed Cavalieri twice to win the 2WD Buggy title earlier today, the factory Losi driver landed hard over the double at the Kyosho corner, breaking the front right wishbone. This left Cavalieri and Neumann to go head to head for the win with the former European Champion pushing the former World Champion hard but just as a challenge looked set to take place the German put his Durango in to the pipe. A second mistake on the penultimate lap left Cavalieri to cruise to the win with Neumann, who finished third overall having tied with Evans on points, summing up the race by saying ‘I tried’. Cavalieri, who gave the EOS concept a big thumbs up and praised how smooth the event ran, said it was a hard third Main but he was able to run more consistent helped by the fact that track conditions made it easier to lead than chase. Despite his retirement, Evans was pleased with second overall in 4WD Buggy saying ‘Cav TQ’d 2WD and I beat him and I TQ’d 4WD and he beat me so we are pretty even’. Outside the top 3 Lee Martin was the best of the rest finishing fourth overall for Tamiya ahead of Kyosho’s David Ronnefalk who was the best of the young local talents, who made a big impression this weekend. With the dust now settling on the Euro Offroad Series Pilot event, the experience has been very educational with race organisers Scotty Ernst and Uwe Rheinard already working on plans for a season long EOS Series to begin in November. 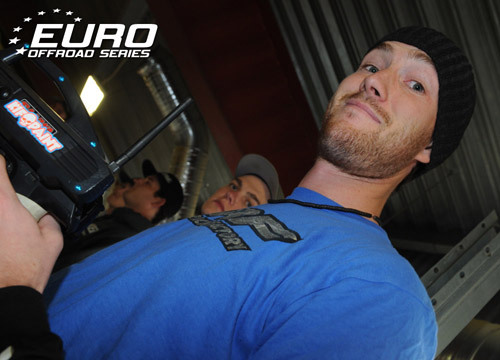 A full announcement regarding the inaugural 2011/12 Euro Offroad Series will be made shortly. The EOS team would like to thank Associated, Losi TLR, Team Durango, Tamiya, Kyosho and their drivers for getting behind this new concept and making the pilot race a reality. A special thanks also to the Tomelilla Motor Klubb for all their hard work and hospitality over the weekend.